what’s up or down with your antibody, Affinity can tell you. Q: How should I store my tube of antibodies? A: Please store the antibodies in the original tube at -20°C and do not aliquot. The antibodies are provided in a buffer that contains 50% glycerol, avoid repeated freeze. Q: How should I store my SDS samples of phosphorylated proteins? A: SDS sample cell lysates can be stored at -20°C for short-term use (less than 3 months), but should be kept at -80°C for long-term storage. The degradation of activated protein samples varies dramatically, depending on the nature of each protein and how much activated the protein is within the samples. Q: Can I incubate this antibody for 1 hour at room temperature instead of overnight at 4°C? A: The antibody modifications include phosphorylation, acetylation and enzymatic cleavage. Most antibodies raised against such modified sites have a lower affinity when compared with antibodies recognizing whole proteins. So it is highly suggested to prolong antibody and antigen interaction time to obtain best signal to noise ratios by incubating overnight at 4°C. Q: What buffer should I use to prepare my cell lysate samples? A: Please check our datasheet for the recommended buffer in the Western blotting protocol. Q: Will your antibodies work on my whole tissue sample lysates? A: We do not test all antibodies on whole tissue lysates in-house, but many of our antibodies have been used by other customers on whole tissues with satisfying results. Q: How do I prepare good control cell lysates for this phosphorylated target protein? A: Please check our datasheet for the western blot figure in the WB protocol, that will demonstrate a suitable control cell line and drug treatment. Q: If a species is not listed as cross-reactive with your antibody on the datasheet, does this mean that the species has not been tested? 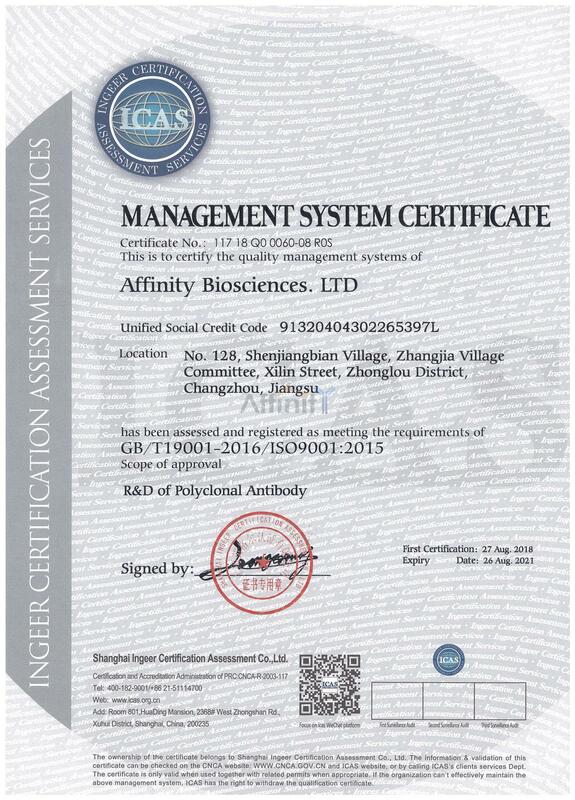 A: Affinity Biosciences tests all antibodies on human, mouse and rat species if possible. If we do not obtain positive results in one species, we do not list that species. However, it is possible that the cell line we test may contain a low level of particular protein or the inductions we used do not work in that particular cell line. Therefore, we suggest you compare the peptide sequence around the modification site (5 amino acids on each side) between the species you are studying and the species that our antibody was raised against. Generally, our antibodies are raised against the human protein sequence and are highly purified using affinity chromatography. Many times if the sequences are identical or have only 1 or 2 amino acid differences in residues other than the phosphorylation site, there is a good possibility the antibody will recognize your protein. Q: Why isn't this antibody working by Western blot? A: There are several details of Western blotting procedure that are critical to avoid loss of signal and or high background. a) Do not over wash the membrane. Washing should be performed with TBS/0.1%Tween-20 three times for 5 minutes each. Excessive washing can wash away the primary antibody. b) Do not over block. Excess blocking can reduce the specific signal visible with some antibodies. Check datasheet for the recommended blocking time for each antibody. Q: How do you ensure the quality of your antibodies? A: Affinity Biosciences strives to test all our products on major applications such as Western Blotting, IP, IHC and ELISA. We constantly test our antibodies on different species including human, mouse and rat and new applications. Product quality is the most important consideration, if you should be interested in a particular application not listed on the datasheet, please contact us at support@affbiotech.com for update or for help with any technical questions you may have. Q: How do you control quality for different lots? A: Affinity Biosciences strives to achieve product consistency or improvement from lot to lot. As a standard, we test the new lot in all the applications we recommend side by side with the old lot. The recommended dilution for each application is optimized for each lot following our protocols. Concentrations between lots of antibodies are constantly adjusted to obtain better results. Q: Can I order this antibody without BSA or glycerol? A: For bulk orders, many of our antibodies can be prepared to the customer's specifications. Contact us at order@affbiotech.com. Q: Could you develop an antibody for me? A: Gladly! Contact us at order@affbiotech.com for details.